Happy new year everyone! I hope you all had a good break. I don’t know about anyone else but my fave part about the holidays is the time between Christmas and New Year as I get a chance to do DIY and organise stuff I’ve been ignoring the rest of the year. 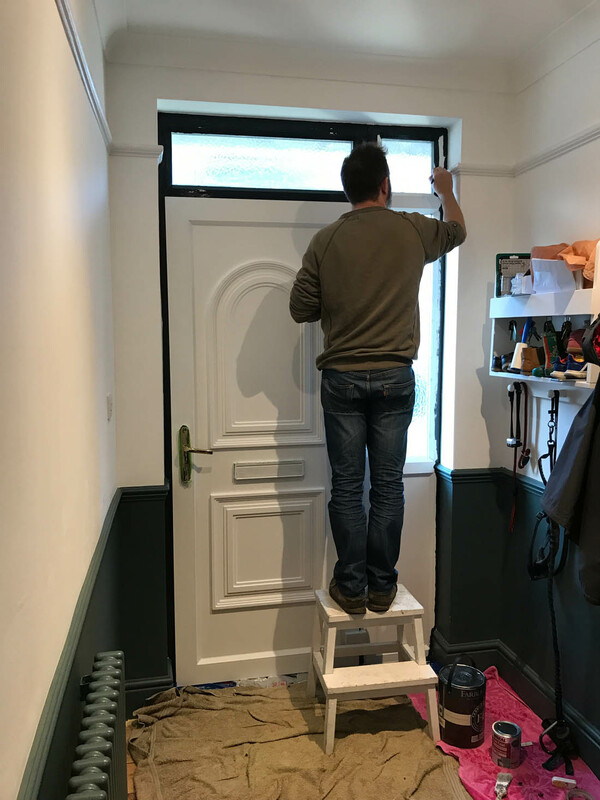 We took this opportunity to figure out a solution to a problem that’s been bugging me since we moved into the house which is our horrid UPVC front door. 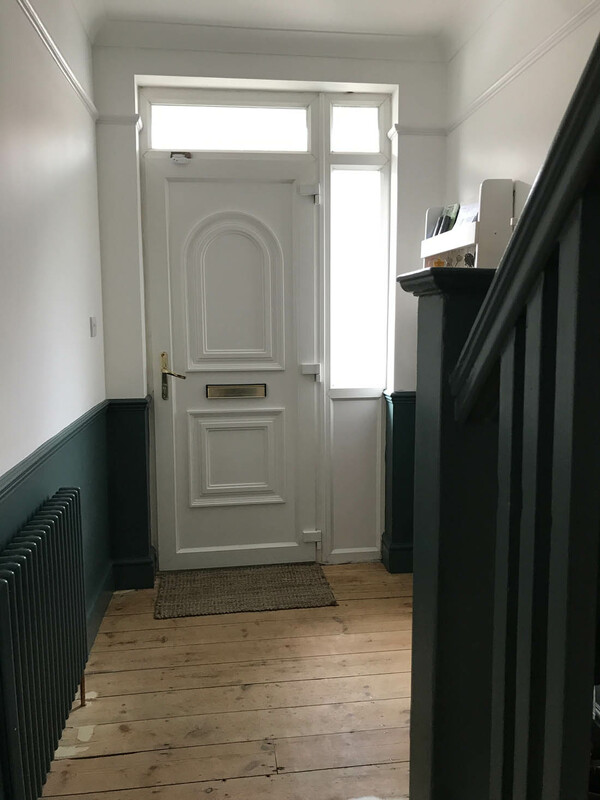 The door does not match the period style of our hallway so one day I would really love to change it back to an original 30s wooden front door. In the meantime, however, I have been desperate to find a way to improve the way it looks from the inside without spending much (absolutely no point in doing anything to the outside yet as that would be the very definition of polishing a turd! The brown pebble dash frontage and rotting fence have to be sorted first before anyone can even think about the front door). 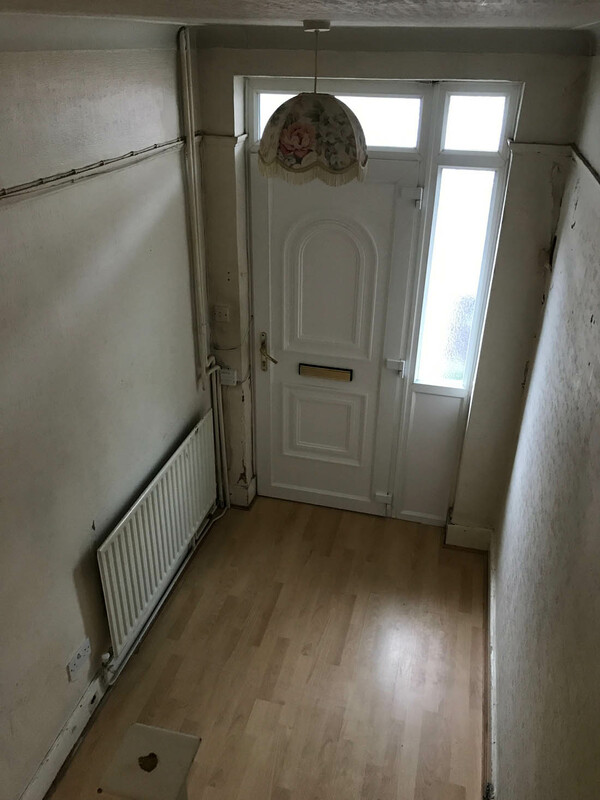 The door is a very cheap one with unpleasant mouldings and no glazing so it’s a big solid lump of white plastic and the sheen of uPVC is perhaps the thing I like least about it. We have uPVC back doors and windows throughout the house, which don’t bother me at all (in fact, I’ve grown to be very grateful for them as they are so effective) but the front door is such a large lump of the stuff that I just can’t bear it anymore. I just don’t want those faux period mouldings in my life! 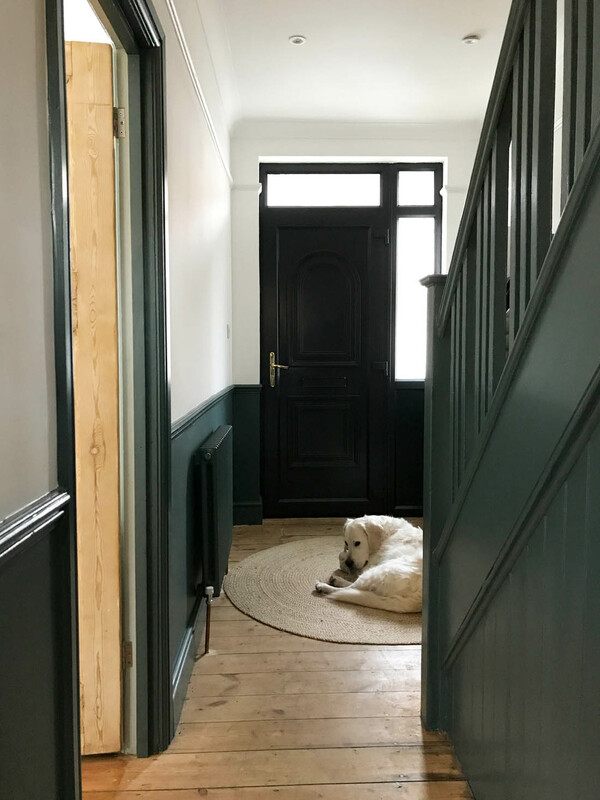 We talked about paneling over the door and other impractical solutions like that and the only sensible thing we could come up with was to paint over the door in a very dark colour that would make the mouldings disappear and remove the sheen of the uPVC. But you can’t paint over this type of surface…right? Wrong! We’ve done it. It’s a triumph and I could not be happier with the results. 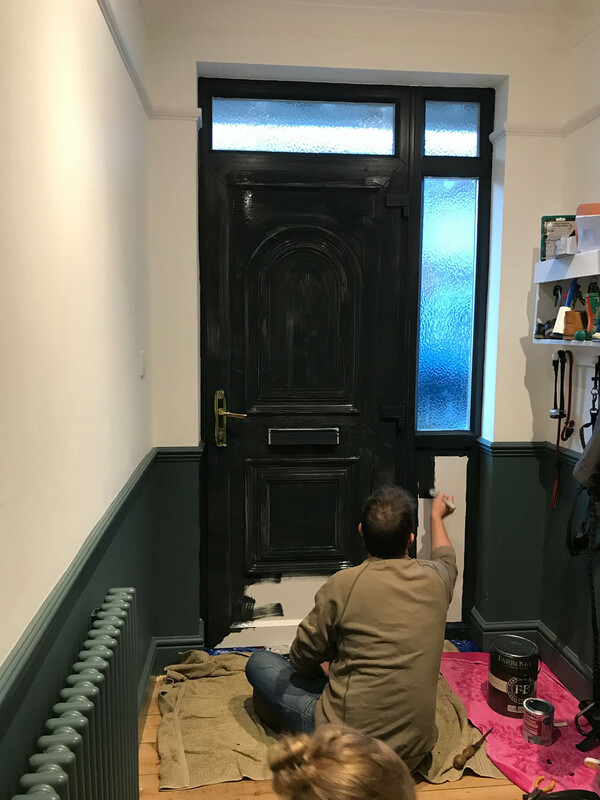 Ronseal had asked me to choose a product for a DIY project I was doing at home so I chose their One Coat All Surface Primer and Undercoat with the intention of transforming the inside of our front door and beginning the process of making our hallway feel and look better. It worked so well and we went over it with a very dark blue satin paint left over from our kitchen cabinets so we’ve made a big difference with very little cost. When we first viewed the house the hallway was very shabby with lost of random pipes and the uPVC front door. Post works we had decorated the hallway but the front door remained exactly as it had been when we first bought the house. 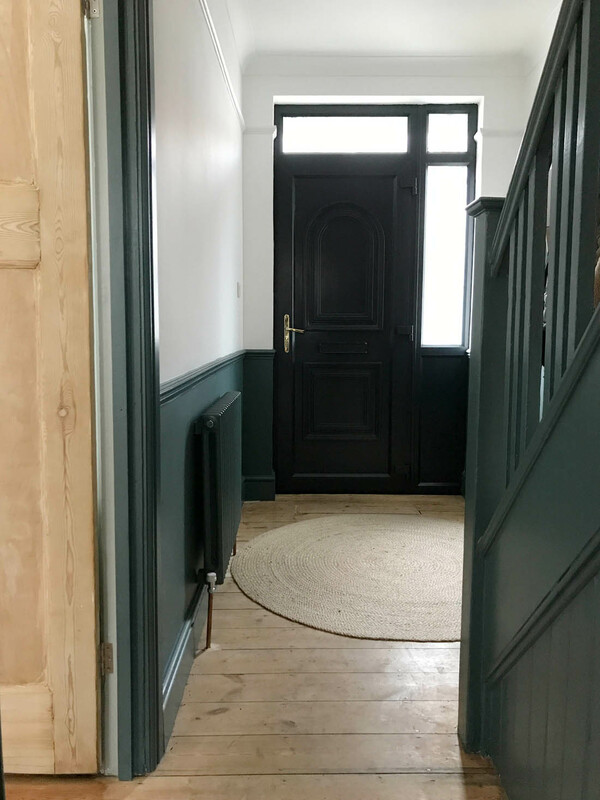 You can see more of what the hallway looks like in this post and whilst I am very happy with the paint colour, the introduction of a dado rail as well as dipping the original internal doors the front door just stood out like a sore thumb. Almost as bad as the uPVC was the gold plastic letterbox 😉 There was no point painting over the white plastic in any colour other than a very dark one – as the dark colour is what would help make the mouldings far less obvious – and I thought choosing the wall colour would be a bit overwhelming so I went with the same paint as we choose on our kitchen cabinets (you can see details of my kitchen here). However, a primer suitable for uPVC was essential to make sure the paint adhered to the shiny surface of the plastic. We prepped the door with Ronseal’s One Coat All Surface Primer and Undercoat after a light sand and clean. 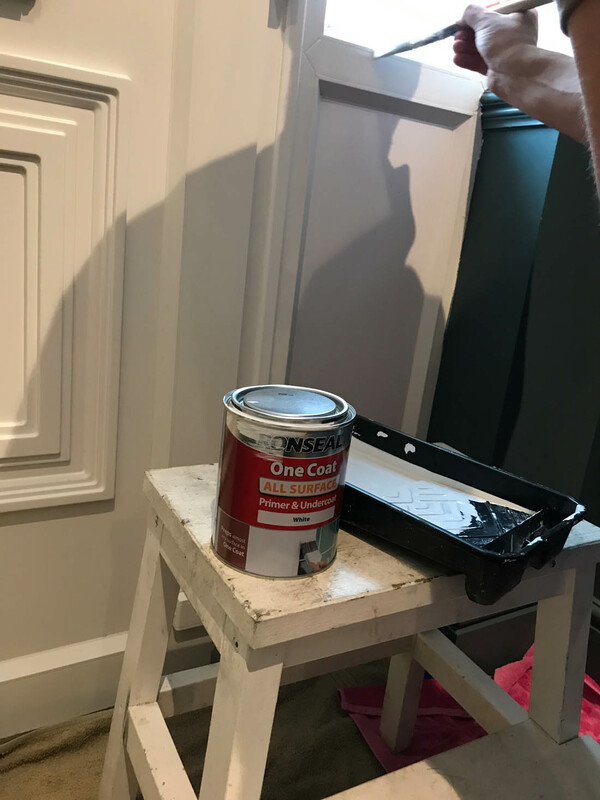 The primer was very easy to apply and it did only need one coat. 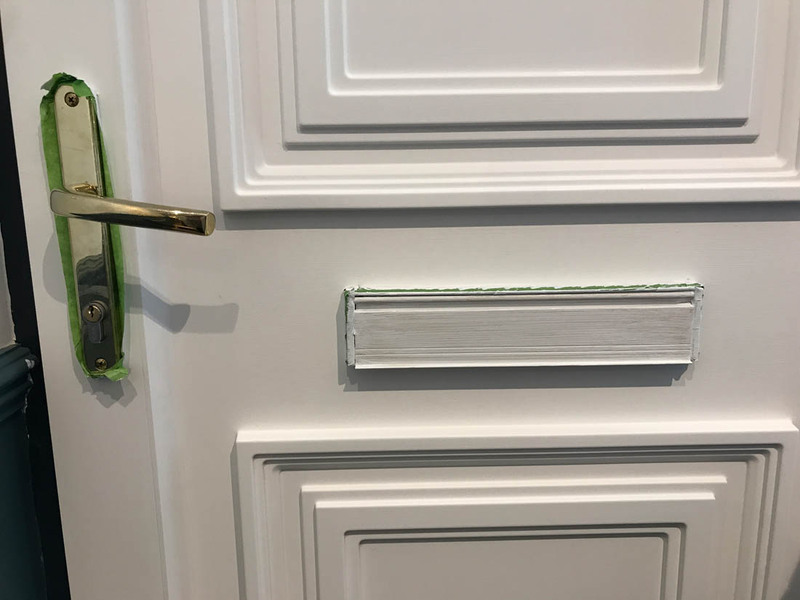 We also decided to prime and paint the gold plastic letterbox and we may replace the handle for a dark one too but we didn’t think it was worth painting it because of the wear it gets. The primer took no time to go on and then Jules took over to do the top coat paint. As you can see because the primer is white it took two full coats and one light touch up coat to cover the white. Jules used a paint brush to apply the paint as that was the only way to do the fine detail of the mouldings and letter box etc. The paint adhered really well and Jules was careful to do quite a thin coat to avoid drips. I could tell as soon as the paint started going on that the dark colour was definitely the right choice. You can use any paint you like to go over the primer. 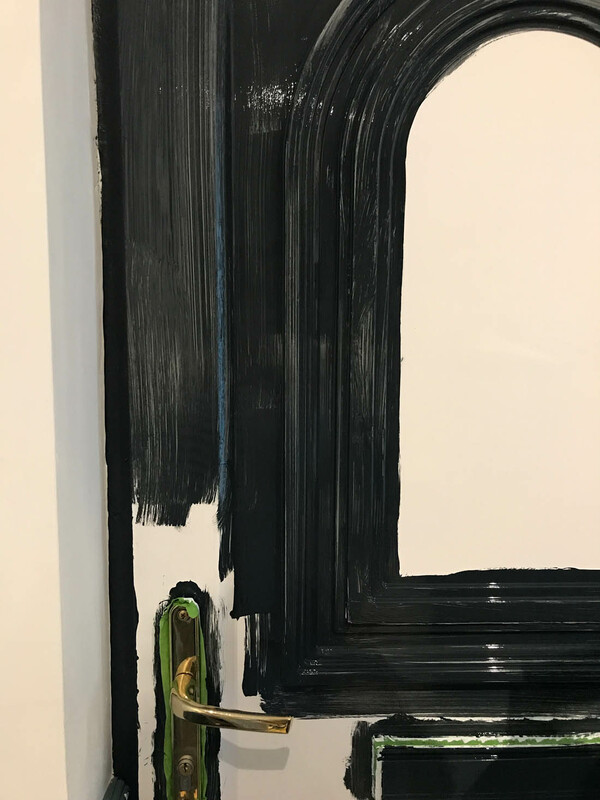 This is what the door looked like before we went to bed that night and we waited until the morning to do the second coat. 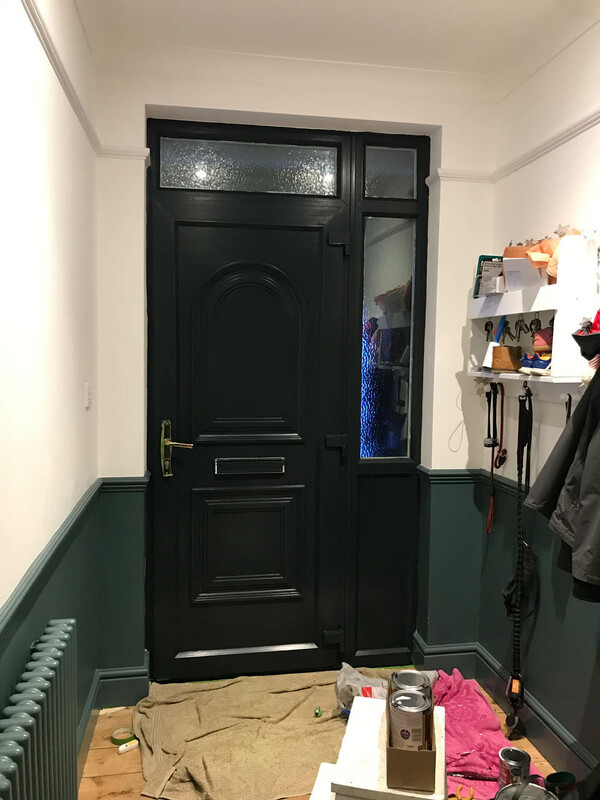 After the second coat the door looked like this and the shine of the satin paint could be seen making the door look more like a painted wooden one rather than a plastic one. We did end up with lots of brush strokes in the paint so it definitely wouldn’t be classed as a professional paint job but I really don’t mind as it makes it look and feel a bit less pristine, which is part of what makes it stick out like a sore thumb when contrasted with the old floorboards. 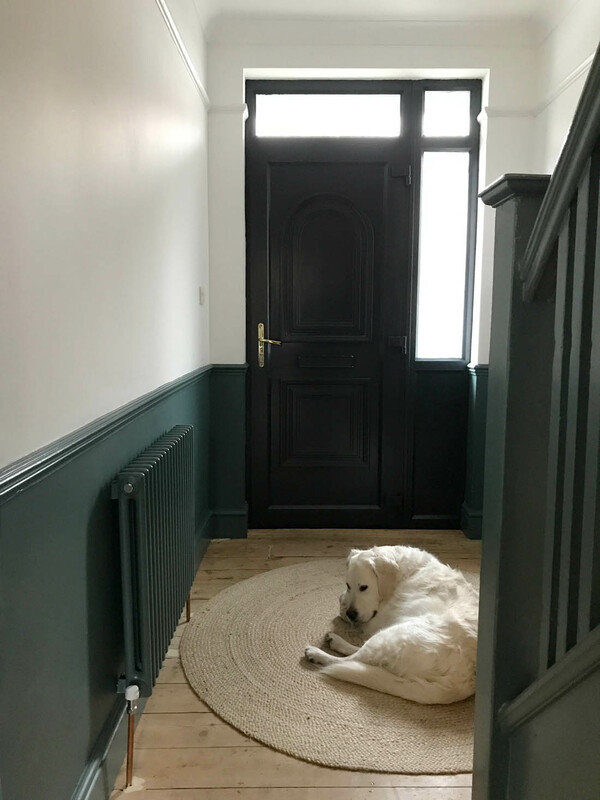 As you can see, the mouldings are far less obvious in the dark colour and I think the colour works well with the period feel of the dado rail and wall colour. Being able to paint over the letterbox has also made a big difference, in my opinion. 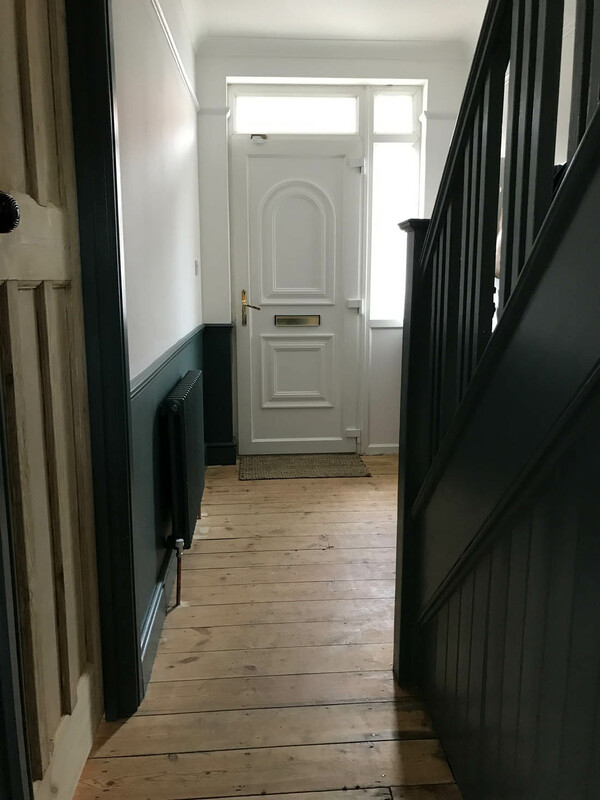 I am delighted with the results and the texture of a painted door rather than a plastic door is such an improvement! 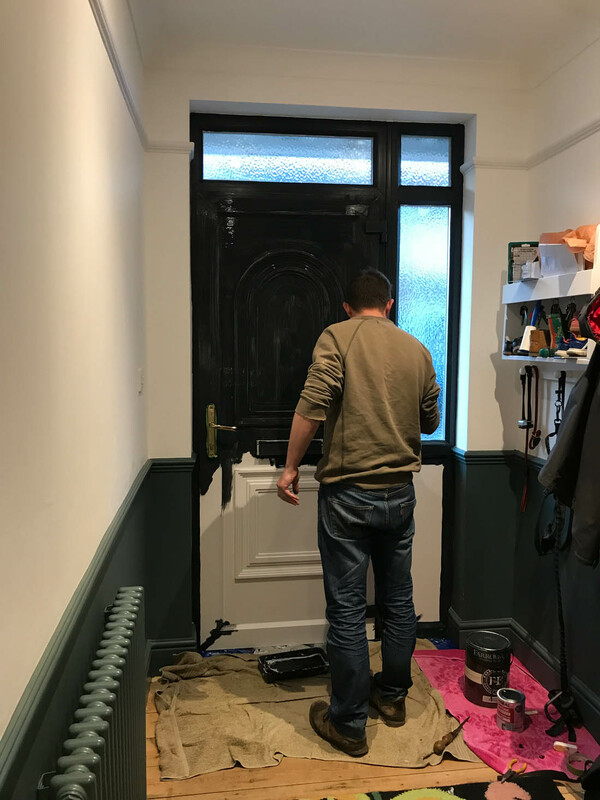 I’m amazed how easily we were able to paint over the uPVC and it’s just the temporary fix I was looking for before we can afford to fit an original 30s door. I’ve now got my eye on a lovely big round mirror to go on the left hand wall and a ceramic wall light to soften the light in here as the spotlights are hellish. After that we need some prints and storage furniture but all in good time. *This post was written as part of a paid collaboration with Ronseal. 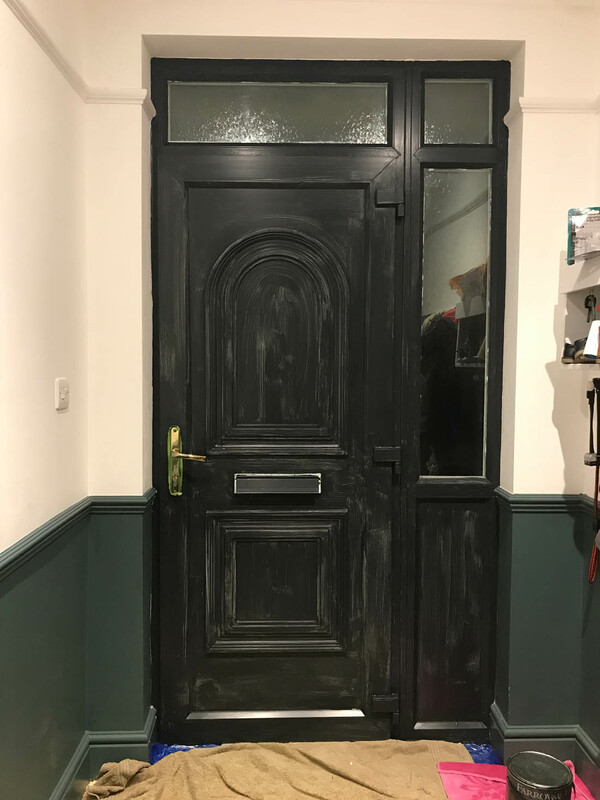 My front door is up close and I never dreamt painting it would be so easy.It is navy blue but has faded so a once/twice over in black would be just the job. Katy it looks so good! Well done you, such a clever solution. Love it! Have you left the outside white? We have a v similar house with a hideous white PVC door and then a wooden one after an equally hideous porch. I’m tempted to paint ours now! We also have the brown pebble dash frontage to contend with. Job well worth doing! Looks great. Fantastic! I just had my hallway + living room decorated and got a new paned wooden door for the Lvng.rm which faces the PVC front door. I asked painters if they could paint it, after hums n haws the door had a lick of white paint.. so still looks horrid! I’d love a beautiful solid timber door but the budget is now blown (+some) Thankyou for the inspo. I’m already on it? It looks wonderful! I love that you painted the sidelights molding dark, too. And I’m jealous of your transom window. When you get a new door will you switch how it opens? You’d have more room to enter and have easier access to the storage shelves. We painted our front door inside and outside in Railings and it’s a total triumph. So cheap and such a transformation.